Things seemed to be going to plan, as the first few days reports from Fair Isle were all related to the bad weather (fog, rain, wind) whilst Grace and I enjoyed sunshine, ice creams and catching up with my family. Then the text 'Orca!' from Susannah, followed by superb pictures of three animals that lingered round the island. Ah well, a bit gutting to miss that, but we've been very lucky for sightings this year already, so it's not the end of the world. Next came the news on Friday that Two-barred Crossbill had indeed made it to Fair Isle, not one though, but a flock of 8 (eight) on Hoini! OK, so that's a bit galling to miss, but hopefully they'll stick around, or we may even get more by the time I return. An Icterine Warbler the same day at Schoolton was a bit concerning - surely autumn migration can't have started already, this wasn't the plan. Best not panic though, that's probably a one-off isn't it? Either way, there was not much I could do about it, so I enjoyed dinner in the garden at my parents', with my first ever Comma butterfly in County Durham (they've spread north since I moved away from the area and I very rarely make it back in the summer) and even a display from the Red Arrows as the Sunderland Air Show kicked off just to the north of us. After going to bed, I was vaguely aware of a text message coming in during the small hours. In my bleary eyed state, I thought I read something about 'Swinhoe's', but almost went back to sleep, assuming it was an old message from our previous encounter. 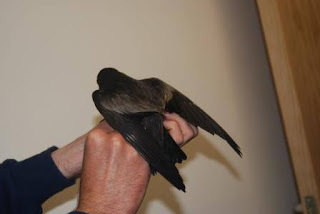 But hang on, look at the date and the time; that's just come in from Will, and it says they've caught the Swinhoe's! 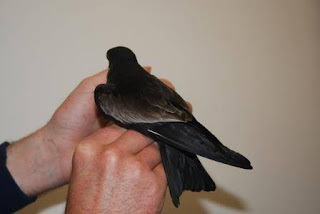 I'll confess that my first reaction was 'why am I not out catching Stormies tonight?' and to throw on my clothes, before the sickening realisation as I opened the door that this wasn't my bedroom on Fair Isle and there was no way I was getting to see the bird tonight! I did see the pictures Susannah posted on Facebook but that's the closest I got. Still, I'm very pleased for the team and I hope they're enjoying themselves now. Although a sixth record for Britain is not as rare as some of Fair Isle's previous visitors, this has to rank up there as one of the outstanding records for the island. 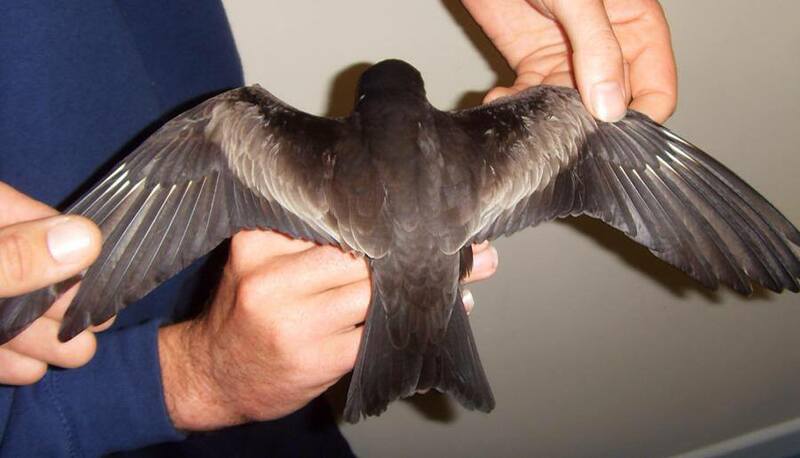 Swinhoe's Petrel by Noa Eden. Crikey! ﻿I'll put more details up when I return (if I can face it! ), but in the meantime, I suggest any petrel enthusiasts who haven't already done so, get themselves a copy of Petrels Night and Day (which is where the recording came from that we use for trapping sessions, we can't send it to out I'm afraid as it's copyrighted material, but the book is well worth getting anyway! ), get the nets up and the tapes running and start trying to find out if there are any more out there (the limited number of records in Britain and elsewhere in Europe do seem to suggest there are perhaps mini-surges of the species into the North Atlantic, possibly coinciding with especially hot summers...). Good luck! Bird of the year? It'll certainly take some beating, even on Fair Isle (picture by Noa Eden). Go on then, one more. This one by Will Miles. The last of the texts from the FIBO team came through at 5am, I imagine there was some celebrating going on last night (and probably a late start this morning; with thick fog returning to the island there's no rush to be out - the continued sunshine in Sunderland is no real consolation!). Is there anywhere better in the UK? I doubt it!